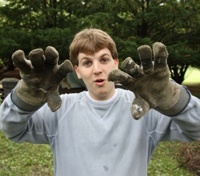 Welcome to the Ithaca Shakespeare Company's e-mail newsletter! Ithaca Shakespeare Company, either in person or through our website. Having trouble viewing this message? Click here to view it in a browser. We've extended the deadline for our logo design contest, so you have a few more days to get your submission in. The new deadline is Monday, November 30, 2009. See the full guidelines on our website. ISC Artistic Director Stephen Ponton will be teaching a course on Acting Shakespeare at the Community School of Music and Arts in Ithaca, beginning in January. 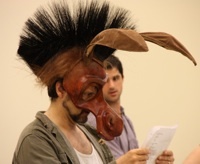 This course is designed to introduce actors of all levels of experience to the unique demands of performing Shakespeare, and to give them the tools they need to do it well. Ages 15 through adult are welcome. And to make it even more fun, we'll be working on scenes and monologues from the ISC's upcoming play - Macbeth. See a full course description here. See the whole gallery of behind-the-scenes photos. Want to know more about the people who make these shows happen? We've added profiles of the ISC's core members to our website. Read about our people here. Want to know more about the ISC's roots and how it developed? The ISC takes on the Scottish play! Join us next summer for this feast of swordfights, soliloquies, and the supernatural! 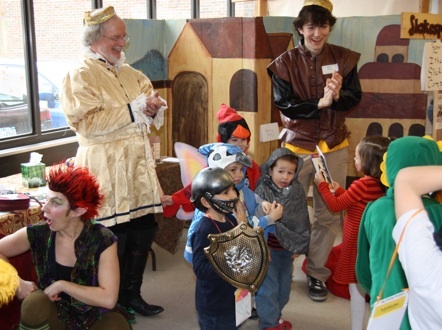 The Ithaca Shakespeare Company's "Shakespeare Lane" was a big hit at the Family Reading Partnership's annual Kids' Book Fest on November 14th. This event is part of the FRP's mission to help children experience the pleasure of books as part of everyday family life, right from the start. The costumed ISC members greeted a steady stream of parents and children, who put on costumes of their own, read adapted versions of Shakespeare's plays and books about his life, played with a miniature Globe Theatre, composed poems out of Shakespearean words, and were entertained by the juggling and antics of King Mark, Duke Dave, Puck, and the rest of the ISC crew. Kids and parents left with ISC bookmarks in hand, and a good time was had by all. Theatre is a collaborative art...and so is running a theatre company. Shakespeare's theatre company was run by a group of "sharers," a small group of actors who were all part owners of the company and who ran it collectively, sharing in the risks, rewards, management, and decision-making. Similarly, the ISC is run by a group of core members who live in Ithaca and who have all been involved with the group for several years - in some cases, from the very beginning. Some of us may concentrate more on certain aspects of our operation than others, but we all participate in the overall management of the company, we all pitch in to do the things that need to be done, and we're all right in the thick of things year after year and production after production. It takes a village to raise a theatre. On the other hand, Shakespeare's sharers couldn't do everything by themselves, and neither can the ISC's group of core members. Shakespeare's company included short-term hired actors, gatherers to collect the admission fees, stagehands, boy actors, and musicians. In addition, the company interacted with and was supported by many other elements of Elizabethan society: aristocrats who gave old suits of clothes to be used as costumes, vendors who sold food and drink at the performances, publishers and printers, noble patrons, court and city officials, and many others. Along with the members of the core company, the ISC's shows draw on the talents of many longtime residents of Ithaca and mainstays of the Ithaca theatre scene; students, staff, and recent graduates of Cornell, Ithaca College, and TC3; students from all the area high schools; and Equity actors in residence at Cornell's Schwartz Center. 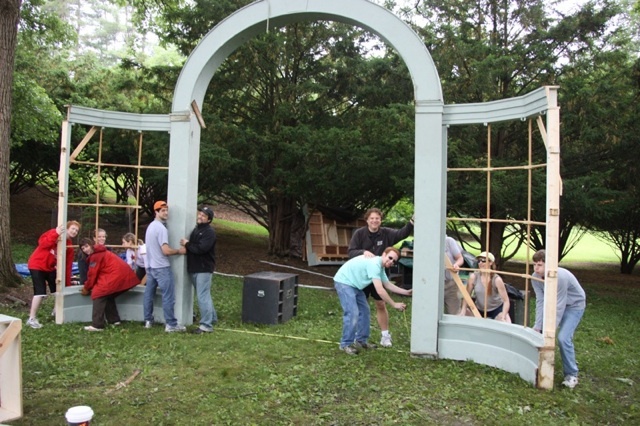 But the success of our program so far has also depended on different types of logistical, in-kind, and financial support from Cornell Plantations, several other departments at Cornell, a number of local businesses and organizations, and, most importantly, our audiences. (More on them in a minute.) As our program grows, we look forward to exploring more ways for organizations, businesses, and individuals in the community to join with us in creating even more exciting and enjoyable events. 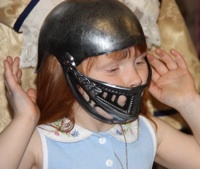 Theatre should be accessible and appealing to everyone. From apprentices and oyster wives to merchants, aristocrats, and the Queen, Shakespeare's audiences included all segments of society. In the same way, we want to make high-quality Shakespeare productions affordable, understandable, and exciting to anyone. Look around the audience of one of our shows and you'll find everyone from young children sitting on their parents' laps to retired seniors, from English professors to people who have never encountered a Shakespeare play before. And one of the things we're most proud of is that all of them have been able to enjoy our productions. It's often said that Shakespeare's theatres were the equivalent of a modern movie theatre. There's something to this idea: like the best modern movies, Shakespeare's plays are high art, popular art, and mass entertainment all at once. And like the best movies, Shakespeare's plays combine visual spectacle, exciting action, fascinating characters, compelling dialogue, intense passions, deep psychological insight, profound philosophical meditations, conflict, comedy, and a curious, questing, critical examination of life, history, and society...all in one package. There's something there for everyone, and our goal when we perform is to do justice to all of it. Outdoor theatre is magical...and so is indoor theatre. Most of us know that Shakespeare's company performed outdoors, in natural light, at the Globe theatre. But they also acquired a small indoor theatre, the Blackfriars, as well. From that point on they performed at both places: summers outdoors at the Globe, winters indoors at the Blackfriars. It was one of the keys to their success, and Shakespeare's plays moved effortlessly from one setting to the other. When the right people come together in the right place at the right time, amazing things are possible. Shakespeare's London was a boom town, and his theatres were part of a rapidly expanding entertainment industry that developed to meet the demands of the city's growing population. The London theatres quickly became famous throughout Europe for the quality of their art. Foreign ambassadors and wealthy travelers wrote home about the glories of the Elizabethan theatres, and the English acting companies toured to great acclaim in Germany and elsewhere in Europe. Ithaca is not Elizabethan London, of course, but we feel a similar sense of possibility here. Our experience with the rapid growth of our program over the past several years has convinced us that a full-fledged Ithaca Shakespeare Festival is not just a possibility, it's an inevitability. We've got the right people, Ithaca is the perfect place for it, and we've already begun laying the foundation. We want to make Ithaca a center for world-class Shakespeare performance and education, and we're taking steps every day to move toward that goal. We hope you'll stay with us as we do, and join us in building something amazing here. Happy Thanksgiving to all from the Ithaca Shakespeare Company! Ithaca Shakespeare Company, please forward this message to them. sign up for our newsletter yourself.